The Battle of Bautzen 20-21 May 1813. Following Napoleon’s victory at Lützen on 2 May 1813 Prince Ludwig Pyotr Wittgenstein’s Russo-Prussian army retreated to Bautzen, where it was reinforced by 13,000 Russians commanded by Prince Mikhail Barclay de Tolly. Napoleon had received reinforcements from France, including a Young Guard division, four Old Guard battalions and two cavalry divisions, and also now had the support of the Saxon Army. He replaced the previous split of his force into separate Armies of the Elbe and Main with a single Army of the Elbe. It consisted of two wings. The northern one under Marshal Michel Ney contained 79,500 infantry, 4,800 cavalry and 26 artillery batteries. The main body, under the Emperor’s personal command, consisted of 107,000 infantry, 12,000 cavalry and 53 artillery batteries; 19,000 of the infantry and 4,000 of the cavalry were Guards.. His step-son Prince Eugène, who had performed poorly in this campaign, was sent to command in Italy. Napoleon’s main problem was that his lack of cavalry meant that he was uncertain of the location and strength of the enemy. He deduced that the bulk of the Allied army would fall back on Bautzen, with a portion covering Berlin. On 12 May the Emperor sent forward a strong reconnaissance force under Marshal Jacques MacDonald in order to find the enemy. Ney’s wing was to prepare to move on Berlin. Diplomatic negotiations continued. Prince Klemens von Metternich, the Austrian Foreign Minister, offered to mediate, sending delegates to both sides in order to discover what they would offer Austria. Dominic Lieven points out that the Austrian aims of restoring their lost provinces and of restoring the balance of power in Europe were supported by Austria and Russia, but opposed by France. Napoleon planned to send Armand Caulaincourt, one of his closest diplomatic advisers, to negotiate directly with Tsar Alexander rather than talking via Austria, but Caulaincourt had not departed by 16 May, when MacDonald discovered the enemy at Bautzen. The Emperor ordered IV (General Henri-Gatien Bertrand, VI (Marshal Auguste Marmont) and XI (MacDonald) Corps to pin the Allies whilst Marshal Charles Nicolas Oudinot’s XII Corps out-flanked them to the south. Ney was ordered to bring his own III Corps and General Jacques Lauriston’s V Corps south. His II and VII Corps were supposed to continue to advance on Berlin, but Ney misunderstood his orders and brought them south; F. Loraine Petre argues that this error was to the French advantage, as it meant that more troops were concentrated against the main enemy force. Ney’s orders were complicated. On 18 May he was told to march on 20 May as if he were joining MacDonald, but on 21 May to move eastwards towards the enemy rear. Napoleon hoped that this would enable him to force the Allies back towards the neutral Austrian frontier, meaning that they would be either destroyed or forced to surrender. 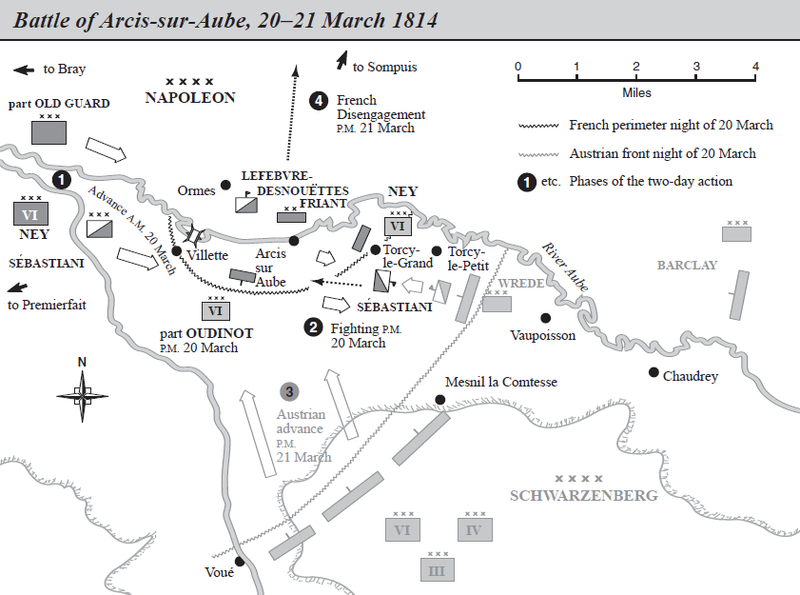 Napoleon spent 19 May reconnoitring the enemy. They were in a strong defensive position, but he overestimated their strength, thinking that they had 150,000 men rather than the actual 96,000. As Ney was not in position, he decided to fight a battle of attrition on 20 May, before enveloping the enemy the next day. The Allies intended to stand on the defensive at first, before counter-attacking on their right. They expected the French to attack their left, in order to force them away from Austria. The French artillery bombardment began at noon on 20 May, with the main infantry attack starting at 3 pm. By 6 pm they had captured the city of Bautzen and the Allied front line. The Allies continued to reinforce their left. They knew that Ney was approaching from the north, but greatly underestimated his strength, so ignored him. David Chandler says that ‘Napoleon could hardly have hoped for anything better.’Napoleon’s plan for 21 May was that VI, XI and XII Corps would pin the enemy, Ney’s III Corps would attack the Allied right and Lauriston’s V Corps would block their retreat. This should force them to strip their centre to strengthen their right flank.Bertrand’s IV Corps would deliver the main attack under the supervision of Marshal Nicolas Soult, who had carried out a similar manoeuvre on the Pratzen Heights at Austerlitz in 1805. A reserve consisting of three infantry divisions, one of them Old Guard and the others Young Guard, and three cavalry division, including a Guard one, supported by 80 guns was established. 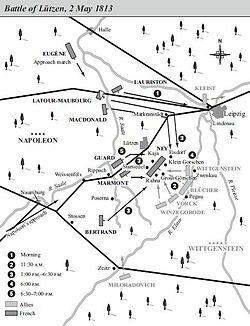 The only explicit order given by Napoleon to Ney was that he should be at the village of Preititz by 11 am. His chief of staff, Baron Antoine-Henri Jomini, advised him to screen it and advance into the enemy rear, but Ney launched a series of frontal attacks. Lauriston also moved slowly. The French attacks in the centre was held up until by a gallant Russian defence, but increasing casualties induced the Tsar to allow limited withdrawals from 4 pm. Napoleon, noting that the enemy resistance was weakening, committed his Imperial Guard against the Prussians. The Allies were now forced to retreat, but Ney and Lauriston’s failure to advance into their rear meant that they were able to do so safely, extracting all their guns, apart from some that had been disabled. A heavy rain storm stopped any pursuit. Napoleon had again won a battle, but failed to rout the enemy because of the failure of his subordinates to block the enemy retreat and a lack of cavalry to pursue the defeated foe. Both sides suffered about 20,000 men dead and wounded. D. Chandler, The Campaigns of Napoleon (London: Weidenfeld & Nicolson, 1966), pp. 888-90. F. L. Petre, Napoleon’s Last Campaign in Germany, 1813 (London: Arms and Armour Press, 1974, first published 1912), pp. 100-2. D. C. B. Lieven, Russia against Napoleon: The Battle for Europe, 1807 to 1814 (London: Penguin, 2010), p. 317. Petre, Napoleon’s Last Campaign in Germany, 1813, p. 107. By April 1813 Napoleon had rebuilt his army, but was at war with Prussia and Russia. His field forces in Germany consisted of the 121,000 strong Army of the River Main, 58,000 men in the Army of the Elbe, 20,000 troops in the detached I Corps, command by Marshal Louis Nicolas Davout, and 14,000 cavalry under General Horace Sebastiani. On 25 April they were faced by only 110,000 Russians and Prussians. However, the French were weak in cavalry. The shortage of light cavalry meant that Napoleon lacked intelligence about the enemy’s strength, positions and manoeuvres. Advancing French columns were harassed by enemy light cavalry because there were not enough French horsemen to protect them. 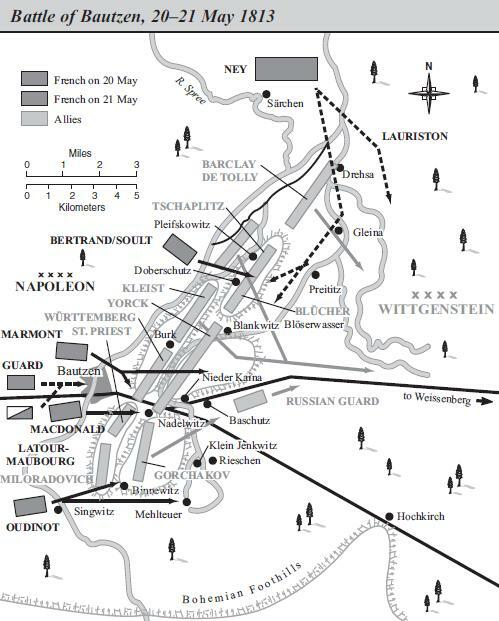 Napoleon’s initial plan was to advance on Berlin. His northern flank would be protected by the fortresses of Torgau, Wittenberg, Magdeburg and Hamburg and the southern one by the Army of the Elbe and I Corps. He would turn the flank of the enemy army and relieve the besieged fortresses of Danzig, Thorn and Modlin on the Vistula. This would release 50,000 more troops for his field army, threaten the Russian line of communication and intimidate the German princes into supporting France. David Chandler notes that Napoleon did not implement this plan for a number of reasons: it would require 300,000 men; he was doubtful of the quality of the troops that he did have; his German allies, Bavaria and Saxony, were reluctant; and he did not have enough troops to protect his communications against an enemy advance in the Dresden area. The Allies concentrated on the Leipzig-Dresden area of Saxony. This covered their communications back to Russia and to Austria, but left Prussia exposed. They had too few troops to protect both, so concentrated on the more important area. Some Prussians wanted to attack, but Prince Mikhail Kutuzov, the Russian commander was cautious. Dominic Lieven comments that even the ‘ever-aggressive [Gebhard von] Blücher’ remembered that in 1805 the Austro-Russians had attacked before the Prussians were ready and had been defeated at Austerlitz. Kutuzov died on 28 April. He was replaced by Prince Ludwig Pyotr Wittgenstein, described by Lieven as being ‘[i]n many ways the most suitable candidate.’ He had won more victories than any other Russian general in 1812, spoke German and French and was popular with the Prussians. However, he was junior to two of the Russian corps commanders, Alexander Tormasov and Mikhail Miloradovich. Consequently Wittgenstein was appointed to command only Blücher’s Prussians and Ferdinand Wintzingerode’s Russian corps. Tormasov and Miloradovich received their orders from Tsar Alexander, ‘sometimes without [Wittgenstein’s] knowledge’ according to F. Loraine Petre. Napoleon ordered his troops to cross the River Saale on 1 May. They encountered opposition, notably at Weissenfels, where Marshal Jean-Baptiste Bessiéres was killed, but the crossing was completed. 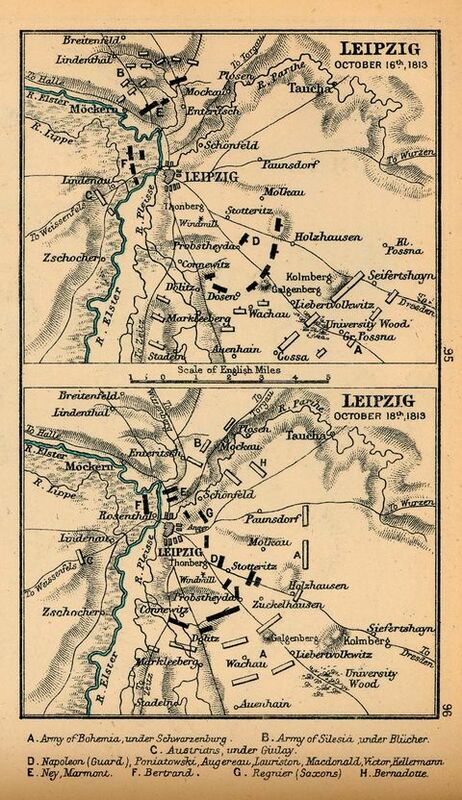 Marshal Michel Ney’s III Corps occupied Lützen in order to protect the southern flank of an advance on Leipzig. At 4 am on 2 May Napoleon told Ney to send out strong patrols towards Zwenkau and Pegau, and to occupy Lützen and the villages of Kaja, Rahna, Gross Görschen and Klein Görschen, which lay along a ridge. Ney did not send out the patrols, which would have found the enemy army, and kept three divisions at Lützen.Wittgenstein, learning that there was only a weak French force at Kaja, decided to attack it. His troops were supposed to start moving at 1 am and be in position by 7 am. Their columns became mixed up in the dark, and were not in position until 11 am. The Allies could see only 2,000 French troops, so Wittgenstein ordered the Blücher’s Prussian cavalry to charge them at 11:45 am. However, they were shocked to find themselves faced by two divisions. The French were also surprised, because they had not sent out patrols. Blücher waited until artillery could be brought up, allowing the French time to deploy. General Jean-Baptiste Girard’s division occupied and held the village of Starsiedl, but General Joseph Souham’s division was forced to withdraw from Gross Görschen. Napoleon and the main French army were marching on Leipzig. Ney had been with Napoleon, but hurried back to his command on hearing the gunfire. He ordered a counter-attack , which led to a desperate action around the villages and along the ridge. Napoleon quickly devised a plan to envelop the enemy. Ney’s III Corps should hold, with Marshal Auguste Marmont’s VI Corps coming up to support its right flank. Further to the French right, General Henri-Gatien Bertrand’s IV Corps would threaten the Allied left flank. Marshal Jacques MacDonald’s XI Corps would attack the Allied right. The Imperial Guard would reinforce the centre. Despite appeals from his commanders, Napoleon refused to commit the Guard too soon. The Allies were hampered by a wound to Blücher and the slow arrival of Russian reserves. The Tsar held back his Guards, apparently thinking that the battle was going well and wanting to personally lead them in the decisive attack. The French flanking forces were in position by 5:30 pm. At 6:00 pm the attack was launched by XI Corps on the French left, the Imperial Guard and VI Corps in the centre and IV Corps on the right. The assault, with heavy artillery support, threw the Allies back. The French won the battle, but Chandler notes that Napoleon needed two more hours to make his victory complete. He lacked the cavalry to pursue the enemy in order to turn a victory into a rout. Petre and Lieven both argue that the delay in the initial Allied attack in the end disadvantaged the French. An earlier start to the battle would have meant that Napoleon and his main body of troops were closer to the action when it began. They would have arrived earlier and would have had more time to complete their victory. Better reconnaissance by Ney would also have allowed Napoleon to move earlier. The battle showed that Napoleon and his command system could still react far more quickly and flexibility to battlefield developments than his enemies. He had won a victory, but lack of time and cavalry meant that it was not a decisive one, and the French suffered heavy casualties. Chandler estimates that there were 115,000 French and 97,000 Allied troops in the vicinity, altthough not all of them engaged in combat. He reckons that 20,000 French and 18,000 Allied troops were killed or wounded. Charles Esdaile argues that the French casualties were high because the inexperience of their troops meant that they had to use ‘clumsy and unsophisticated’ tactics. The Allies retired towards Dresden. An action took place at Colditz on 5 May between French troops under Prince Eugène and the Russian rearguard, commanded by Miloradovich. The Allies did not stop in Dresden and failed to destroy its bridges. Napoleon reached it on 8 May. Two days later the King of Saxony declared for Napoleon. The Allied retreat ended on 13 Mat at Bautzen, a strong defensive position. They were reinforced by another 13,000 Russian troops under Prince Mikhail Barclay de Tolly. D. Chandler, The Campaigns of Napoleon (London: Weidenfeld & Nicolson, 1966), pp. 874-75. D. C. B. Lieven, Russia against Napoleon: The Battle for Europe, 1807 to 1814 (London: Penguin, 2010), p. 311. F. L. Petre, Napoleon’s Last Campaign in Germany, 1813 (London: Arms and Armour Press, 1974, first published 1912), p. 58. Lieven, Russia against Napoleon: The Battle for Europe, 1807 to 1814, p. 315; Petre, Napoleon’s Last Campaign in Germany, 1813, p. 85. C. J. Esdaile, Napoleon’s Wars: An International History, 1803-1815 (London: Allen Lane, 2007), p. 501.